Faye Longchamp and her daughter Amande have landed an archeologist job in Rosebower, a rural New York town founded by Spiritualists. When town matron Tilde Armistead invites Faye and Amande to a séance and turns up dead, Faye thinks there might be more at work in this sleepy little town than first meets the eye. The town is a quaint little place, and as Faye and Amande wade in further, more hidden clues come to light. Here, normal is relative. Who is this boy, Ennis who takes care of root doctor Sister Mama? Are his tinctures safe? Tilde’s estranged daughter Dara and her shifty eyed husband Willow run their own Spiritualist show just outside the town limits. What do they have to gain from her untimely death? A wealthy developer has his sights set on the land Tilde’s sister Myrna has inherited and now her health is strangely declining. Is he involved? What of Toni the Astonisher who has landed in Rosebower set on writing an expose on the secrets of this soon to be upended little hamlet. One thing is for sure. Rosebower won’t be the same. The story enveloped me at the onset. Never having read a Faye Longchamp series mystery before, it took me a moment to sync with the characters, but not long. Faye and Amande are likeable, practical people and I loved following the story as they explored old junk at the town museum and with the occasional successful conquest. The story really got going as Faye and Amande joined Tilde for a séance and she ends up dead, a victim from complications from arson. As the town reals from the horrific event, other things are set in motion that will soon collide, changing the innocence of Rosebower forever. Rosebower reminded me very much of Lily Dale, another Spiritualist community where if you look down the street, you will see a shingle on nearly every house depicting what specific talent the psychic holds. 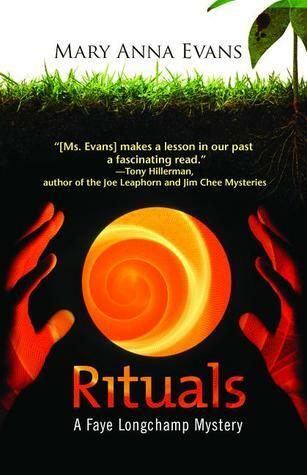 The politics, bickering and all the things you would see in any small town can be found within the pages of Rituals, with the added flavor of the Spiritualist movement. Normal here would be crazy anywhere else, but in a town where hoodoo curses and crystal ball reading are as common as four o’clock tea, Faye and Amande have their work cut out for them. The museum owner is convinced that within his dusty walls hides the secret to alien civilizations. Faye enlists the assistance of her husband Joe, who is imbibed with a Creek heritage and special observational skills of his own. His arrival is timely as the destructive forces walking the streets of this small town converge with murder on the agenda. The plot in this story is woven together like a tapestry. The interjection of Toni the Astonisher’s notes between the events was a useful tool and helped me as a reader get behind some of the illusion that marks the trade. This book was an enjoyable read and I want to find out more about the island life that Faye shares with Joe and how Amande came to be adopted by them. Great voice and a compelling mystery! I wouldn’t hesitate to read anything else by this talented author. If you want a series where you will learn something new as you read, then this one is for you!